This has been going on for just a little too long. 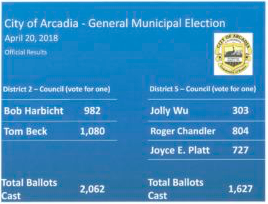 Arcadia's City Council election happened over six weeks ago, and still some people can't seem to deal with the fact that Bob Harbicht lost the April 10 election to Tom Beck. I mean, guys, this was just a relatively small town City Council election. What's the big deal? Certainly you can somehow put your disappointment behind you and rejoin the human race in a civil and forthright way. Trust me, you're not the first people to have candidates that didn't win a political race. But you are now rapidly becoming some of the worst election sore losers Arcadia has ever had the displeasure of seeing. Here is what I think this is really all about. Yes, Bob Harbicht lost. Yet somehow the sun still comes up in the morning. The award for Sore Loser for the Month of May has got to go to Mark Hong. This guy has literally gone over the edge and straight into the Crybaby Hall of Fame with his current rather frightening obsession with relatively recently re-elected Arcadia City Councilman Tom Beck. 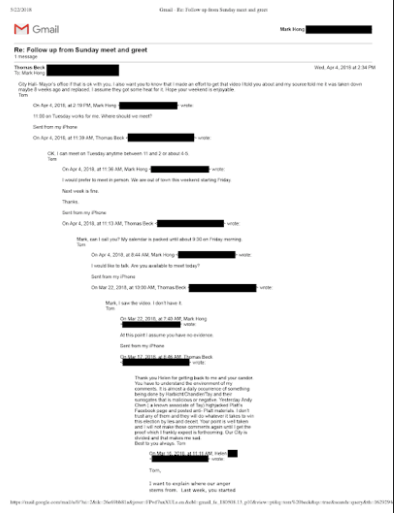 To the point where Mark has now posted all of his personal emails with the guy. You see, apparently the highly complex Mark once upon a time liked Tom, but that changed. These emails are from when his man crush was fresh and love was new. Here is Mr. Hong's latest on the otherwise anonymously published Voice of Arcadia. It appears that questioning some of the lurid and misleading claims he's made on a Facebook page constitutes being attacked in Mark's rather troubled world. As an example of just how crude an effort this actually is, here is a screen shot of one of the emails reproduced on the heartbroken Mr. Hong's crush site. Virtually unreadable, right? And I am not just talking about the blacked out parts. Either somebody doesn't really want you to read these emails because they in no way back up his bizarre claims, or he just needs a good nap. Beck won, Harbicht lost. You don't see any of these kinds of crybaby antics over the results of the 5th District election. It is time for some people to get over the results of the 2nd District vote as well. Hope it's just disappointment and not hate. OK Mr. Hong, it's over, get with the program before you loose your station. It could be that Mark Hong and his wife Helen Wu are Sho Tay supporters from the very beginning, and the "Meet n Greet" in their house could be a trap set up deliberately for Beck & Platt. Remember Beck & Platt did not want to go to the "Meet the Candidates" event at the library since it felt like a trap. If a person is lying about a few things, chances are very good they are lying about a lot of things. Nothing Hong says is believable. Arcadia needs moderate and sensible leaders, not irrational bomb throwers. 8:05 Mark did not lie about any thing. You just want to cover the truth. It looks to me Tom is not acting as a professional consistently. Is it against ethnic codes? In this case, yes, election fraud, punishable under the law. 12:04 PM, we know you belong to the group of Sho Tay/Harbcht/Chandler & supporters. Tom Beck won despite of all the smear campaigns against him. He has demonstrated excellent leadership and intelligence as a Councilman and former Mayor. More importantly, he defends long-term Arcadia residents' property rights against investors/developers. Mark Hong is the kind of person only lying Sho Tay loves to befriend with. 12:04, you are kidding with your comment, right? If not, I’m really worried about you. discreetly shared by a threatened Mother who felt she had to obey & conform protect her children . Unbelievable for me to learn that this is true & not an isolated . Where are the fearless Tiger Moms we hear about ? Which school failed do far? Those emails (once again) prove that Tom Beck is an intelligent human. This Mark dude needs to get a life. Tom has such low intelligence, it is unbelievable. But it is fact now. I suspect that most of what he says goes far over your head. Facts only, no guess around please. He must be off crying somewhere, other than his once post here he has not returned to bless us with more of his intelligence. Oh Marky, where are thou? Do not poke at "Mad Mark". We don't want him upset. He may come back and it is annoying. Don't try to shut up any body who tell you the facts. The truth is always hard to take, be grown up please. I never said to shut him up only don't provoke him with pokes. What he writes does not pass the clean hands test. Because Mark's words don't belong to the rumor category, so it is not clean to you? That makes sense now. Will Amundsen whimp out (again) and not vote for April come Tuesday? It would be a shame if such tactics were to succeed and Tay become Mayor. This Hong character is not a good indication of how things would go should Tay be put in charge. The point is we don't want any criminals here. Peter should vote to the best of candidate who can serve, not creating hates, like April has done so far. April should stop those illegal activities. On your planet telling the truth is illegal? April's world is legal for all criminal cases. Abetting location to generate more criminals. Arcadia will be full of bullies if April were our major. Lots of law suits too. Tax payers will take the consequences for sure. Do you realize that you make no sense? Half of the olive trees on Michellinda are now taking a nap forever; nothing but stumps left. Kinda like the Giving Trees. The stumps'll be gone soon now too I'm sure. I guess the rest of the trees are lined up for the chopping blade today. Been nice knownin' y'all. So much for the "Tree City." Take down the signs. The problem we have is no body care if Tom or April cut the trees. Blindness is the problem. What are you looking for? The comment was about some trees in Sierra Madre. True but think of the entertainment value. Tay will now have to talk and attempt to control the meeting versus him just approving the prior meeting minutes and voting however Chandler votes. It will be utter chaos. The Mayor votes last. If mayor, Sho will continue to dangle on Chandler's puppet strings. It is safe to vote last if you have no mind of your own. Mayor votes last to break a tie. Who is the voice for sanity in the Asian community? We are hiding. Involvement has consequences. You make it sound like this is a mob situation. That's how organized crime does their politics. Intimidate the good people while running their own candidates. Asian is kind of reliable now. The problem is this group of people are plain deaf. Making up rumors according to their imagination. So sad. Tree City no more, your UUT monies hard at work for all in Sierra Madre. The emails prove Beck is a good guy and didn’t lie. Take a look at the stumps. Any sign of interior decay? I don’t know Tom that well, but doesn’t appear he has any interior decay, seems pretty sharp. Those trees were healthy before being cut. Can't we see it by ourselves? Please don't fool ourselves. City Hall in Sierra Madre is becoming increasingly brisk. This is all about money and development. David Liu, Mark Chen, and this Hong person, just want to disrupt as a way of derailing anything that would get in the way of mansionization. Take it for what it is. What we see here is important to know, but always remember what it is meant to do. Don't fall for it. David Liu actually was the advocate to protect trees. He made it well known to the whole city. He protested it strongly about it. Where were we, tree protectors? Sounds all fake. No stump decay, just a way of beautifying the dirt walk way on Michilinda ave. The city would not want anyone tripping up or down the street. This was a major hazard that needed city halls imminent attention, you know, the management wants to avoid any new law suits regarding negligence on behalf of the City of Sierra Madre. Had there been injuries and law suits? Tom Beck is for development mansionization as well. Then why did they run their stooge against him in the last election? Mark should have released the lies before election. Too late. You can only wonder what is going on in his mind. It’s been near 45 days, did the FPPC complete the Tay investigation? If not, will the CC defer the Arcadia mayoral vote further ? Usually when you defer something, your brain kicks in and you defer it long enough to be necessary. In this case Amundsen arbitrarily chose 45 days having ZERO clue if that would be sufficient for the investigation to conclude. And the dude runs a business. It is good to have longer time for us to know what April had done to this campaign, especially the criminal case of team work of sign stealing. We can wait for it. Peter is pretty wise Mayor any way. Your nose is getting very long. Soon you will not be able to reach your computer keyboard. The perpetuation of hateful & stupid emails points to desperation. Developers are out of ideas to throw their money at . The Historical Ordinance is not going away. On June 5 in CC expect these disrupters to use consistent vocal disorder whenever a comment is made by speaker or Council . They expect relentless pressure on the Mayor will install Sho as Mayor. Parliamentary procedure was never meant to allow a corrupt leader to represent our city. It is Power of the people. Face it please. It is fact now. A loud mob undermining order in a City Council Meeting is NOT the "Power of the People". lives to allow freedom of the vote. This community must demand a recall vote of redistricting. I wonder if those who hiss and boo (or clap) at the June 5th meeting will be tossed out of the meeting. The mayor states to be respectful - and not to be disruptive, but folks break the rules anyways. Very disrespectful! Really annoying! Maybe the police chief will toss them out, as he really should. No more waving hands in the air. Nothing wrong to hissing to the racists, who were violating the laws in public place. You know, I'd worry about what you think, but obviously that would be a waste of time. 2:36, Everything is wrong with hissing and booing during a city business meeting. If you listened to the mayor’s words prior to public comments, you would have heard to be respectful. Those hissing, booing and clapping were violating the rules of the meeting. Bottom line, it was extremely rude - acting undisciplined! I admire how you try to put a spin on everything. I had never heard of racist words, or people saying others were racist, until two years ago, when Sho Tay was involved in dirty campaigning to support Harbicht. Sho Tay, and those above and below who are supporting him, started the whole division in Arcadia. So just stop for the good of Arcadia. If you really cared about unity and healing in Arcadia, please stop the comments about race. Rise above. Seems to me Mark Hong writes pretty clearly and logically, probably the next best to the moderator here. Not seeing how he is lying about what he experienced. His name didn’t show up in the district 2 voter list if you will check with Tom Beck. Stella Gu’s voting record in District 5 can also be verified with D5 candidates such as Joyce Platt or Jolly Wu, not that hard. By the way, what do we say about all the speakers claiming Roger Chandler stole Joyce Platt’s election at the April 24 council meeting and ranting about the voter fraud that’s going nowhere so far? 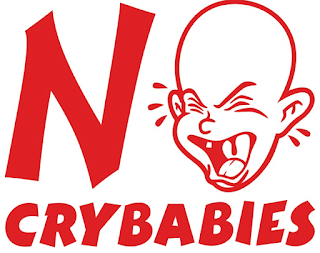 Are they crybabies too? 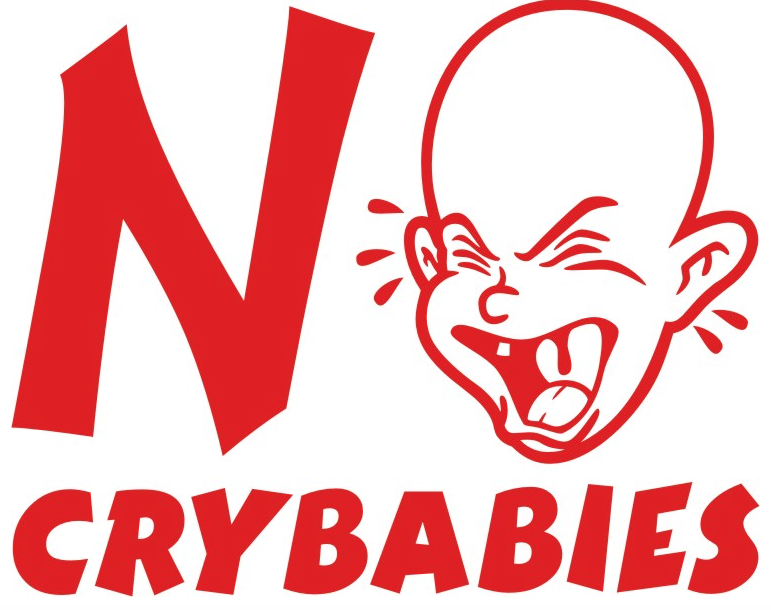 If so it looks like crybabies are everywhere in Arcadia accross age groups and political stances. Pot calling the kettle black? Funny indeed. Let’s not embarrass ourselves. "Seems to me Mark Hong writes pretty clearly and logically..."
Obviously written by someone incapable of embarrassment. Los Angeles County has launched an investigation into alleged voter fraud in District 5. The investigation is ongoing. Unlike much of what Mark Hong says, this is a fact. In his Facebook post Mark, states it was Joyce Platt not Tom Beck that brought up the rumor about the voter fraud video. Mark is full of inconsistencies. Inconsistencies is a nice word for it. That is why Joyce didn't win the election, some flaws showed up at least. The empty nest in District 5 got quite full around election time. This group of people have never grown-up yet. So so sad about their childish, ignorant, easy to be fooled around, or manipulated. I wonder when most of you be matured enough to read the messages and have independent ideas? Do you have better things to contribute instead of negging here all day long? Actually, to be fair, our mod is great bringing up the topic each day. Some people are always misleading, twisting and then start spreading rumors. So shamed to those people. City of Sierra Madre: Mt. Wilson Trail race this Saturday, Veterans Memorial Service on Monday, Pioneer Cemetery. No different than other elections. The looser is crybaby. Local, state, national elections....no difference. Follow the law, accept the results, move on, and try harder next time. The crybaby this time is louder. And nuttier. NOKO, there is a 99.9% that talks will resume as planned, says the South Koreans President. Trump is being played for a fool. Speaking of getting over election losses, TDS (Trump Derangement Syndrome) still reigns in Sacramento as well as on The Tattler. The irony is amusing. Treason is a big issue for some folks. Soon the world will have all the proof it needs. Who knows, they might even report it on Fox News. Wouldn't that be something? Been hearing that for last year....you got something, we're all ears. Good things take time. Enjoy the show. Good things like locking up that nasty woman who lost the Presidential election! She actually won by 3 million votes. But what is math to a Trumper? Check the news re Don the Dumber. Can’t help but lie like his father, but without the superficial charm. The fellas on the cell block are going to have fun knocking the smarmy off his face. Funny how Repubs complain it’s taken one year so far to investigate years of Russia/Trump corruption that have given Putin control over the Oval Office, but were perfectly fine with two or more years of investigating a single day at Benghazi and seven years of investigating the Whitewater real estate deal. Such hypocrites who not only sell out our country, but would no doubt sell their mothers for a few bucks. Everyone keeps asking where the rational people are. Why aren’t they speaking up? I’m going to tell you why…. WE ARE AFRAID! We are afraid of being bullied. We are afraid of community leaders coming after our kids. We are afraid of Kin Hui destroying our careers. We are afraid that OUR face will be the next meme shared maliciously on Facebook. We are afraid but... it doesn’t mean we are not watching, listening and whispering. Thankfully, the Tattler and Facebook have revealed the people we need to be leery of; who to keep at a safe distance and never engage in debate or intelligent conversation with. You might think we are cowards for not getting more involved but we have a lot on the line. This community is very connected through service organizations, schools, sports, local clubs and activities. We stay silent even though we are the nuts and bolts of this community. We are the good citizens, parents, teachers, neighborhood watch people, small business owners, volunteers, coaches, leaders. We’re all races, religions and political parties. We value content of character and integrity in our leaders. We’re the good guys. But… we are afraid to get involved. What does that say about the current landscape of our community? We are the people who say “hello” to each other on the side walk. We are the people who embrace and enjoy the diversity in Arcadia and throughout Los Angeles. We are the people who want peace, a safe community and friendly relationships with our neighbors. We want to see our leaders getting along, working together and solving the problems that impact our daily local lives. Yep... we’re the people who are going to have your back in a tsunami and give you mouth-to-mouth no matter how mean and malicious you have been or who you voted for. Yet, we are the people who are VERY afraid to join the current conversation, show up and help solve the problem, because…… we are afraid of being bullied. So, what does that say about the state of our community? Not sure what the solution is but it's as bewildering as Laurel and Yanny. Thanks Tattler for letting me share some words anonymously because I'm afraid of being bullied. Thank you for the great comment. How can the spell be broken? 6:30, for starters, by not making Tay the Mayor. 6:09 You dared not speak simply because you couldn't face the audience to pass your rumors in the past, we all knew that. You have done great contribution to schools and community, we have seen that, we have been there too. We have been friends except the political world. You understand the historical preservation ordinance, you are against it, but you darenot to speak out. You plugged many signs to most of your neighbors without telling them the truth in your heart, then ended up many voters didnot vote to any candidates. You're always afraid of something, nobody knows what exactly. Please do what you believe it is right all the time, otherwise,I don't believe you can contribute well when we really need your help. Don't take comments personally, no matter what your ideas are. It is for the community. I wish you understand and come out to express it, we can communicate, no fear should be there any time. Some people in this group like to create rumors for last few years, that should be stopped, in order To build a smooth communication environment. Rumors scares most people away. 6:09's post shook up the jackals. 7:01 PM, Hi Markie! Your writing is really bad. It's hard to write well when you think and behave badly. 7:01 PM, Stella Liangyi Gu! With 94 likes and 109 followers, Voice of Arcadia posted on Wednesday @ 10:36pm a share post from Mark Hong’s Tuesday @ 5:35pm post. At the moment, until it gets removed by Andy Chen or Sho Tay or Bob, the VOA 10:36pm post is still there. Interesting...why did VOA delete these two comments? Not to fear, screenshots speak volumes! If Sho Tay wants to be the unifier of Arcadia, then why is he commenting on this crazy VOA Facebook page? It’s a shame too that VOA wrote disturbing comments shaming Joyce Platt on this thread post. 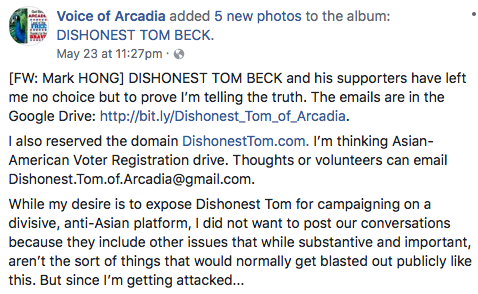 Why did Sho Tay write that article about Tom Beck on Arcadia’s Best and say that Terry Miller wrote it, but then Sho was caught in a lie after lie after Terry Miller called him out on it? How can he represent ALL the people in Arcadia fairly? He’s divided the city. It’s devastating really. Does he have an honest bone in his body? Rhetorical question. Yes I saw both Sho Tay's comment and Markie's reply on Markie's FB page. Anybody get a screen shot? 6:09pm. Ahh, thanks? Mouth to mouth is out dated, no longer a component of resuscitation/CPR. Arcadia is located inland, too much distance for a tsunami, more of a earth liquefaction during "the big one". Don't be afraid, stand up to bullies, you are not alone.